It’s going to be huge! It’s going to be really, really great. Ok, I’ll stop although I can’t imagine publically speaking like that. Seriously speaking, in the last couple of weeks, two of our three Big Investment Opportunities have already begun to take shape offering smart investors a value-oriented place to put your money. Hint, it’s not the S&P 500. For your ease of reading, I have put our shameless suggestions in BOLD throughout this update. Please do your own homework and remember that this does not constitute personal financial advice for anyone in particular. Look at this chart! Anyone who has been an investor for any period of time has to look at this and get very excited about owning a piece of Japan. We are doubled up on Japan now after taking our initial positions in March, May and June. 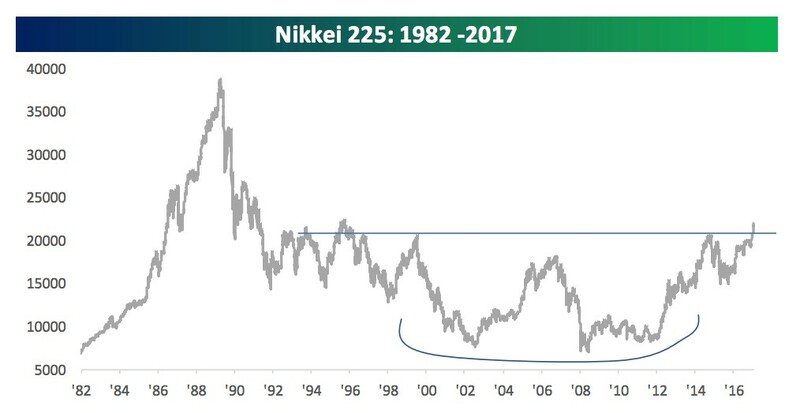 The Nikkie has been forming a long base going all the way back to 2002 and has finally, and decisively broken into a new bull market JUST THIS WEEK. Regular readers know that one of our great long-term investment opportunities described back in September, was to overweight Internationals and Emerging Markets. We suggested that a 40% allocation is not too much. The Japanese economy has been in various stages of recession with sequential bear markets since 1989, almost three decades. Much had to do with cultural issues, bad leadership, an aging population, and overextension in the late 80’s. But with the new Prime Minister, Shinzo Abe, and an adoption of modern central bank policies together with an active program to devalue the Yen and support their export markets, Japan is back in gear and a great value. By the numbers, Japan is still one of the top countries in the world in terms of contribution to global GDP. In fact, on his recent visit, Trump had this to say to the Prime Minister on his way out after three days of lavish entertainment. Donald Trump to Shinzo Abe, PM. … and you’ll be second, ok? Who says something like that? On the other hand, why am I surprised? Other internationals, especially Asia, and Emerging markets continue to plow higher outperforming the US markets by almost two times and coming from a much more attractive valuation base with real, unengineered economic growth. This continues even as the US dollar has moved higher in the last several weeks giving us more confidence that international strength is not just happening on the back of a weak dollar. If you need to cut some exposure, sell US stocks. Commodities are an asset class and represent many things. These include gold, silver, metals, “softs” like pork and corn, as well as oil and gas. For five years, commodities in aggregate have had a very tough time. 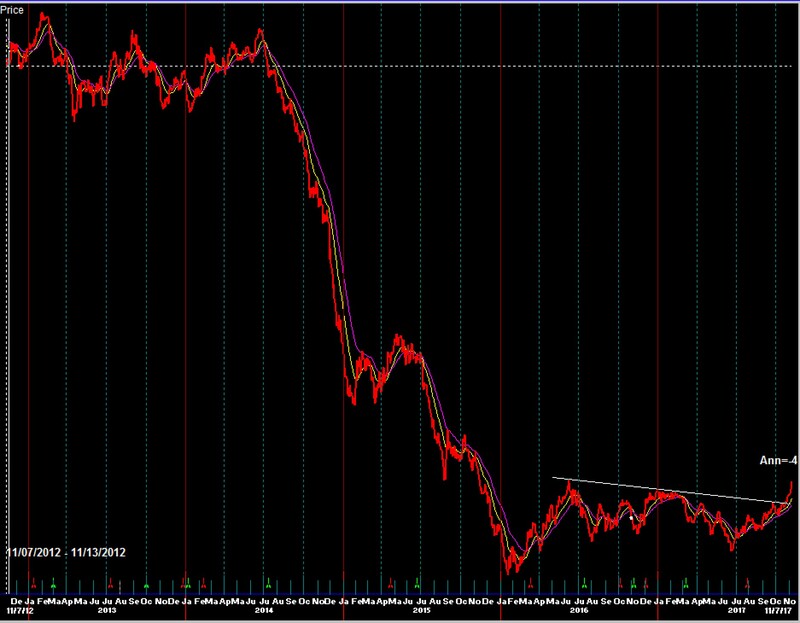 There are commodity indices that include all groups that look like this. Ouch. But focus in on the lower right corner of this chart where you will see a clear break out from a two-year basing pattern. We said in our Three Big Investment opportunities to be watchful for a new bull market in commodities but it might take a while to materialize and wouldn’t likely happen until oil prices looked more constructive. Well, we were wrong. Oil prices have recently surged and are now angling toward $60/ barrel while metals and other commodities continue to march higher. Now all the food groups for the commodity asset class are in gear just as inflation is coming back, just as the Fed is raising rates and just as we would expect when the economy moves into Stage 4 of the business cycle. 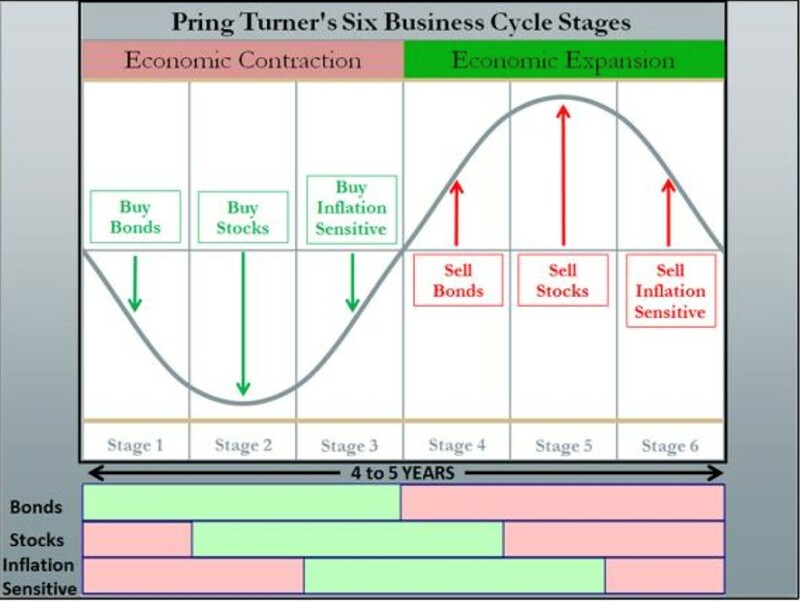 We are now moving into Stage 4 which means, look for opportunities to sell bonds, accumulate inflation sensitive groups like commodities and hold stocks for now (although selectivity matters more). There is one important caveat to the emergence of commodities to the scene. Stages 4 and 5 can be very short especially after a rather long bull market in stocks. This bull market is now the second longest and largest in history if one pegs the start date in March of 2009. US stock valuations are now the second highest in history. Inflation from wage growth, and now commodities, price inputs, together with four rate hikes from the Fed, (soon to be five), has a tendency to put a cap on earnings and lead us into recession. The last strong period for commodities was, you guessed it, 2007, the year before things got upside down in real estate, our economy and global financial market. Commodity strength marks the end of bull markets, not the beginning. It is the last thing to happen in the business cycle in theory and in practice. In early October, when the S&P 500 hit 2550, we said, “attempts to generate big gains from here would be like picking up nickels in front of a steamroller”. Thus far, since October 5th, the S&P 500 has pushed up a total of 38 points to 2590. That’s a little over 1.5%. Keep what you have but avoid the temptation to move heavily into stocks with cash or bonds until we see a significant correction – or bear market. Today marks one year since Trump’s election victory. I have nothing good to say about what I have seen so far, so I’ll just sign off and leave it at that.